Fed up of overly complex supplements containing a long list of ingredients and additives you don’t understand? We are too. That’s why we developed HMB Sport™. HMB Sport is a simple, naturally occurring, science backed supplement that supports muscle cell health. Using this supplement on a regular basis results in less muscle cell damage after all forms of strenuous exercise. This leads to quicker recovery and faster muscle adaptation to your training. HMB Sport Supplement is made from one simple ingredient found in natural, healthy foods. It contains no additives, preservatives or fillers and is for the athlete concerned about what goes into their body. HMB Sport is an ideal supplement for athletes that push their bodies to extremes, such as CrossFitters, triathletes, runners, cyclists, gymnasts or sportsmen/women. What will taking HMB Sport Supplement do for me? The HMB in HMB Sport Supplement is one of the most researched sports supplement ingredients having been tested in over 40 science labs across the world. This research found that HMB reduces the muscle damage caused by heavy exercise (such as a particularly intense run, cycle or CrossFit WOD) allowing quicker recovery and improved performance in the next training session. Researchers have also found that taking HMB speeds up muscle cell protein production as they adapt to training. They also found that athletes taking HMB experienced over 50% improvement in their running and cycling performance gains compared to athletes not taking it. The same results were also observed in strength athletes. Click here to learn more about the research. How does HMB produce all these positive effects? HMB works by slowing down proteolysis (the natural process of breaking down damaged muscle protein) and also speeding up protein synthesis in repair. Scientists think that HMB supplementation therefore minimizes the amount of muscle damage and resulting protein breakdown after hard training, speeding the athlete’s return to full fitness for the next session. Many scientists also think that HMB is also a vital structural component used to maintain the integrity of muscle cells. In athletes that train hard, there is more need for HMB in the diet as muscle damage and repair occur much more frequently. HMB therefore protects the muscle from exercise damage, then speeds recovery enabling you to train harder and adapt to exercise quicker. Graph 1: Muscle damage is dramatically reduced after a 20K run - 13 runners after 6 weeks of HMB supplementation. (Graph will open in new window/tab) Read the research. HMB is a substance that occurs naturally in the body. We use about a ¼ teaspoon of HMB a day to help make and maintain muscle cells. We get this HMB from either eating healthy foods such as grapefruit, alfalfa and catfish or by making it in the body from Leucine, an amino acid found in the protein we eat. In 2000, research was published that took blood samples from 128 men and women of all ages using HMB. The research found that HMB was completely safe to take with no reported side effects. Read the research. Our bodies require Creatine to store energy in the muscles for high power explosive movements like sprinting or heavy weight lifting. We normally get Creatine from eating meat. Supplementing the diet with Creatine has been shown in over 15 studies to enhance strength and mass with training, thought to be through increased muscle water and providing energy for better training. Creatine has been shown to work in tandem with HMB for even better results. HMB and Creatine are two of the most researched sports supplements available on the market having been tested in over 100 research labs. Their ability to increase muscle mass and strength with weight training are similar, yet research has shown that they work differently, meaning that using them together combines their effects. Research into the combination found that they may even double the effects of training. Using HMB and Creatine together is a no-brainer for athletes wanting to get the most from their heavy lifting. HMB doesn’t really have much taste to it so it is often mixed with juices like grape or OJ. HMB is linked to calcium meaning it quickly and easily dissolves in liquid and is absorbed into the body. HMB’s effects are most beneficial when you are pushing your body to its limits in order to stimulate muscle adaptation. HMB’s effects will be reduced if you are not training hard or, as in the case of highly trained athletes, your potential for adaptation to training is smaller (think how much training a 100m sprinter puts in for a tenth of a second speed improvement). For this reason, research on elite athletes has found that HMB only results in small gains in strength and endurance. Calcium-HMB, which is the form we use in our supplements, is the same form it has been tested in. Calcium HMB is completely safe to take with no reported side effects. Ever. HMB (or ß-Hydroxy ß-methylbutyrate) is a byproduct of the breakdown of the amino acid Leucine that we get from dietary protein. It is also found in healthy foods such as grapefruit, alfalfa and catfish. HMB is vital to normal body function as it is used to maintain the health of muscle cells. Supplementing the diet with additional HMB has been shown to improve exercise performance by supporting muscle cell repair and adaptation. What does HMB Sport contain? HMB Sport contains nothing more than powdered calcium HMB (HMB is bound to calcium to help with absorption) contained in a gelatin capsule. HMB is found naturally in healthy foods like grapefruit, alfalfa and catfish and is also made in small amounts by the body. It is stored in muscle cells and helps maintain their structure and function. HMB Sport contains no additives, preservatives or fillers. It is the purest HMB product available today. Like all Blonyx supplements, HMB Sport’s ingredients are consistent with the paleo diet ethos as they are all from foods that would normally exist in a hunter-gatherer’s diet. It is highly likely that the cavemen living amongst the grapefruit trees were the fittest around. 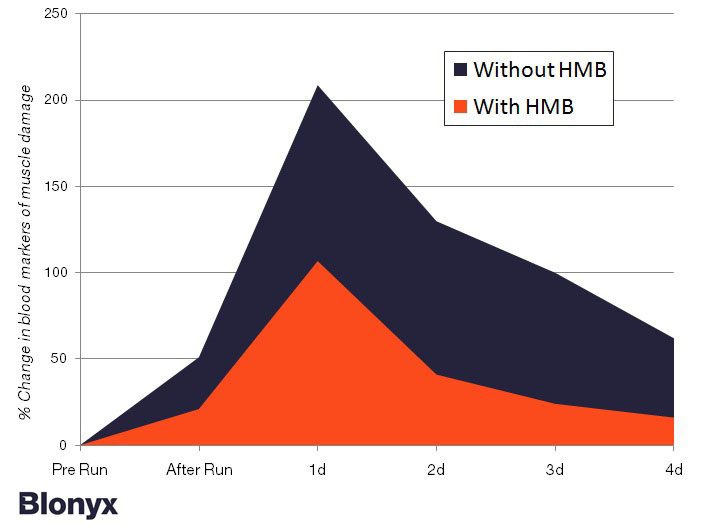 All Blonyx products are based on HMB. HMB Sport™ is simply HMB and calcium in a gelatin capsule. It can be taken along with your current supplement regimen. 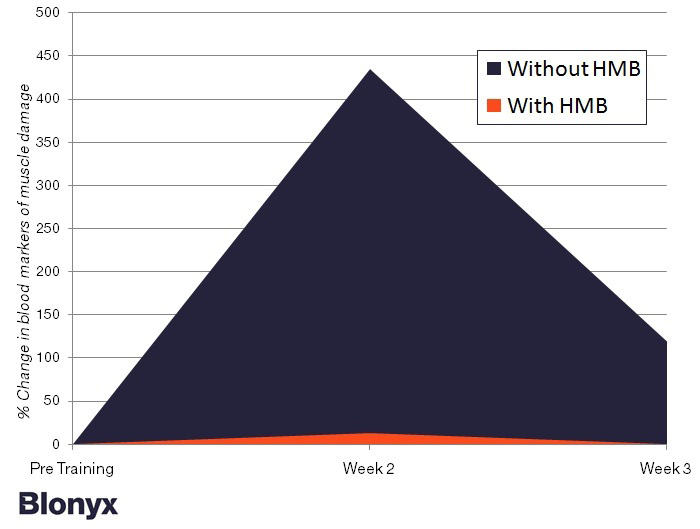 Blonyx’s new HMB+ Creatine product combines the two most researched supplements for enhancing strength and muscle mass. What can HMB do for me? The secondary pictures in the scroll bar above show results from just a few of the research studies on HMB. How safe is HMB Sport? Extensive clinical studies have been conducted to specifically evaluate the safety of HMB with no negative side effects being observed in both men and women whether young or old. A summary of the effects of HMB on hematology, emotional profile and adverse effects as measured in 9 clinical studies showed only positive effects on cholesterol (7% decrease) and blood pressure (4.4 mm of Hg decrease). Note that this was likely caused by better exercise rather than the supplement itself. Why choose Blonyx HMB Sport? There are only a few companies that are licensed to sell HMB in North America (click here for a full list of licensed brands. Brands not on this list are likely to be fake). Unlike the other HMB brands, Blonyx products contain no additives or fillers and are for the athlete that is concerned about what they put into their body. What is it like to take HMB Sport? HMB Sport comes in easy to swallow gelatin capsules filled with powdered HMB. To get the most out of using HMB you need to maintain a good level in your body. This means taking two pills with each meal (three times a day) or three pills twice a day. The capsules can be opened easily to get to the powder if you wish to take HMB another way. What happens if I don’t take my Blonyx supplements regularly? We all forget to take vitamins, prescribed drugs, even brushing our teeth once in a while. Missing a few doses of Blonyx products here and there is unlikely to inhibit your performance gains too much so just continue like normal. We do not recommend that you exceed recommended dosage to “catch up”. How long does it take to see effects from HMB? Studies show that measurable increases in endurance, strength and lean body mass can occur in only a couple of weeks, however, it will most likely take three or four weeks to produce results that you will notice. What can I mix Blonyx product with? Blonyx products are in either pill or powder form. Pills can be taken with any liquid as required to make swallowing them easier. We sell powdered supplements as it gives you the flexibility to mix it with whatever you wish, such as your favorite protein supplement. Can I use Blonyx products with other supplements? Absolutely. Blonyx supplements are safe to take and combine with other sports supplements, be it protein shakes, energy gels, whatever you’ve got. How well do Blonyx powder products dissolve in liquids? Reasonably well, however if your liquid is cold, it may take a little longer to dissolve and can leave an unresolved residue at the bottom of your glass. What do Blonyx products taste like? Blonyx pill products taste, well, as you would expect. That’s why we put them in pills. HMB+ Creatine is in powder form and has a bitter taste. It is made to be mixed with, well, whatever you want. Another reason we sell it in this form is that it is the same form used in research studies. We want to make sure our products work. Yes, our products have been tested on humans of all ages and genders and found to have no negative side effects. HMB has been used by athletes for over 10 years with not a single negative effect reported. Ever. What is so special about HMB? HMB is a supplement that has been around for a while but has not been marketed to the extent that we think it should be. To date only large pharmaceutical companies that take note of the research have shown interest and included it in their products. HMB is one of the most researched products out there with proven sporting performance benefits. We encourage you to try it for yourself and see what you think. If it doesn’t work, we’ll give you your money back! Both HMB and Creatine are currently sold as sports supplements that can enhance strength and mass with weight training. Scientists have shown that they work by different chemical pathways in the body so combining them actually adds their effect together. Researchers even tested this and found that taking the combination of HMB and Creatine doubled the muscle and strength gains with strength training. Who should NOT take Blonyx products? If you are on any medications or have a medical condition, you should always consult with your Doctor before taking any dietary supplement. Does HMB work for women and older adults? Yes, published research has shown that women and older adults who take HMB and exercise have enhanced strength and increased fat loss as well. What will HMB do for runners or cyclists that don't want to bulk-up? Published research has shown that HMB increases VO2 max (maximal oxygen consumption), which is an indicator of endurance capacity. It also prolongs the onset of lactic acid build up in the blood meaning HMB enables harder training without fatigue. In other studies HMB has also been shown to minimize muscle damage associated with competitive distance running and cycling. In all of the above research studies, no excess muscle gains were observed. How much HMB should I take? Most studies have shown positive results with 3 grams a day for average individuals. It is best to split it into three 1 gram servings spread throughout the day. If you weigh less than 120 lbs, you may want to try 2 grams a day. If you weigh over 220 lbs you may want to use 4 grams a day. Are there any negative side effects to HMB? Extensive clinical studies have been conducted to specifically evaluate the safety of HMB and no negative side effects have been recorded in both men and women whether young or elderly. A summary of the effects of HMB on hematology, emotional profile and adverse effects as measured in 9 clinical studies showed only positive effects on cholesterol (7% decrease) and blood pressure (4.4 mm of Hg decrease), likely caused by better exercise rather than the supplement itself. How can I tell if the HMB I buy is real? A company called MTI Biotech in Iowa holds the athletic use patents on HMB. Currently all genuine sources of HMB are required to carry one or more of the following Patent Numbers on the label: 5,348,979 and 6,031,000. The label must also spell out the full name of HMB and include the “ß” symbol. If any of these items are missing, the product is unlikely to contain HMB. It will also likely be cheaper to reflect its lack of real HMB. Are there any negatives to HMB? Probably the biggest problem with HMB is the cost. Because the process to make HMB is complicated, it is a relatively expensive supplement. HMB is not as cheap as Creatine or Whey Protein supplements, but it is as or more effective. We are constantly working to get the price down to make HMB more accessible to all athletes. Medical researchers have proposed that HMB works by slowing the breakdown of muscle protein and even preventing the death of muscle cells through a complex chemical pathway called the Ubiquitin pathway. For the strength athlete this means retaining strong muscle cells. For the endurance athlete this means smaller, energy efficient muscle cells remain intact and healthy, ready for training. Adapting to training requires muscle protein to build or enhance the muscle cells. HMB is thought to stimulate the production of muscle protein to be used in this process through a complex chemical pathway called the m-TOR pathway. In endurance athletes this means that muscles rapidly change to become more energy efficient whereas in the strength athlete muscle cells will grow quicker to generate more power. Overall, using HMB enhances your recovery from, and adaptation to training. It is a product that can be used by all athletes that are training hard, regardless of their sporting event. HMB was discovered by Dr Steve Nissen at Iowa State University. Dr Nissen’s first study on athletes consisted of 41 men who weight trained three times a week, for 1.5h a time, over a three week period. One group received HMB, the other group received a placebo. After 4 weeks, the HMB group showed a greater increase in muscle, lost more fat and were significantly stronger than the placebo group. To date there have been numerous additional, university and peer-reviewed studies done on HMB. Over twelve years, researchers have found that HMB has numerous beneficial effects, including producing better results from intense exercise. The list of HMB clinical studies is continually growing. Currently there are over 20 human studies completed and published as peer-reviewed papers, with more studies set to follow. Only Creatine and protein supplementation has more studies published than HMB. Research Study: controlled 9 week study on trained men. HMB increased lean mass, decreased fat mass and resulted in a substantial increase in lower body strength. Read the research. Research Study: A meta-analysis of existing research. HMB supplementation resulted in clear overall increases in strength in men starting a resistance training program, but that the benefit of HMB in trained athletes was smaller. Read the research. Research Study: Placebo-controlled study in college students. HMB supplementation increased maximal oxygen consumption by 5%. Read the research. Research Study: 1 year long controlled study in the elderly. HMB with two amino acids increased lean mass and protein turnover in older adults. Read the research. Research Study: Controlled study in trained cyclists. HMB supplementation increased cyclist endurance as measured by VO2 peak and lactic acid build-up. Read the research. Research Study: 12 week study on resistance trained men. HMB combined with two amino acids doubled the effects of training on lean mass and increased fat loss. Read the research. Research Study: Controlled study in male and female runners. HMB reduced muscle damage after a prolonged run as well as the perception of muscle soreness. Read the research. Research Study: A review of research on HMB. Concluded that collectively there is not only clinical data, but also mechanistic data supporting HMB's effect on increasing muscle mass and strength. Read the research. Research Study: Controlled study in 35 trained collegiate football players. HMB increased muscle mass and reduced body fat however this was not statistically significant probably because the athletes only used HMB for 4 weeks so gains were small. Read the research. Research Study: A meta-analysis of all research to date on supplementation for strength and mass. Found that HMB and Creatine are the only two supplements that have been shown to enhance strength and mass with resistance training. Read the research. Research Study: Controlled 8 week study in weight training elderly men. HMB increased muscle strength and lean mass while increasing fat loss. Read the research. Research Study: Controlled study in weight training males using Creatine and HMB in combination. HMB and Creatine supplementation results in even greater strength and lean gains than either HMB or creatine supplementation alone Read the research. Research Study: Controlled study in trained males. HMB enhanced strength and mass but the increases were small over the research period. Read the research. Research Study: Controlled study using male and female trained and untrained subjects. The studies showed that regardless of gender or prior training, HMB increases strength and minimizes muscle damage when combined with a four-week resistance-training program. Read the research. Research Study: Controlled study with male weight lifters. HMB increased lean mass and peak muscle torques. It also decreased blood markers of muscle damage. Read the research. Research Study: Controlled study if 40 experienced, resistance trained men over just 4 weeks. HMB numerically increased lean mass and strength over the period of the study. Read the research. Research Study: Two controlled studies in weight training males for three and seven weeks. HMB increased strength and muscle mass while reducing muscle damage in all subjects. Read the research. Research Study: The official position paper of the International Society of Sports Nutrition. HMB was rated in the second highest category of effective supplements for performance enhancement. Read the research.